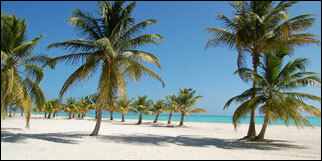 It has become one of the most popular vacation destinations in the Caribbean. It lies on the easternmost end of the Dominican Republic. The area has become the country's most famous tourist haven. The sandy beaches are marvelous and are often palm fringed. The water is a clear turquoise. Punta Cana is packed with low-rise resorts on or near the beach. These are the all-exclusive type, which makes them popular with mainstream families and singles. The better resorts tend to be in or near the Punta Cana town. Years ago "Punta Cana" referred to only the town bearing that name. Today, the "Punta Cana" designation extends well beyond that town. Beach photo is the property of the Dominican Republic Ministry of Tourism and is used with permission.